We've been in York this week, testing our techniques for photographing sculpture in the York Art Gallery collection (more on that in a separate post). 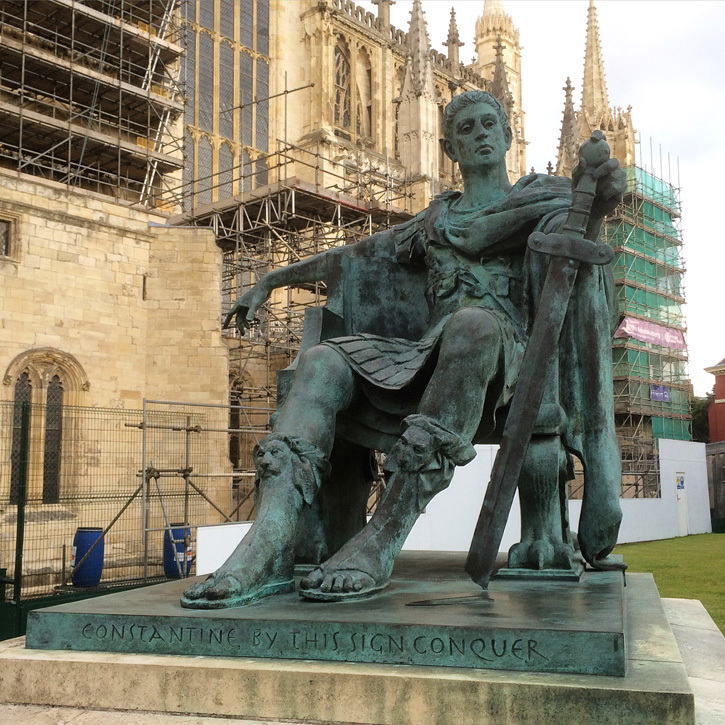 In advance of my trip, I Googled 'sculpture in York' to see what public art or monuments I might be able to see outside around the city. Apart from finding a hairdressers' called Sculpture, my search led me to a statue of artist William Etty (1787–1849), gleaming white after recent cleaning, outside the art gallery; railwayman and politician George Leeman (1809–1882) near the station; and Roman Emperor Constantine (274AD–337AD) looking imperious beside York Minster. 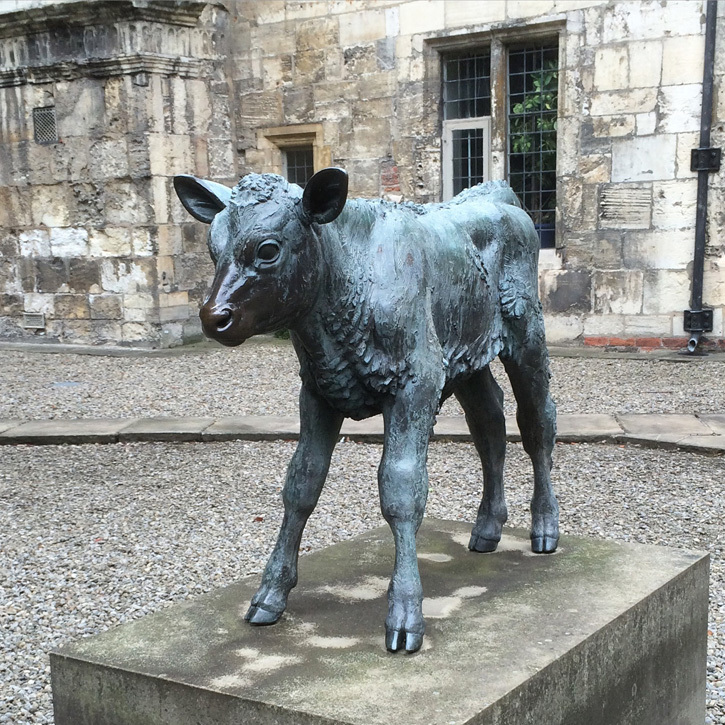 I also spotted a very fine statue of a Friesian calf in the courtyard of King's Manor, one of the buildings owned by the University of York. These statues are easy to find, but there is a whole set of smaller sculptures that call for some serious squinting and neck craning to spot. 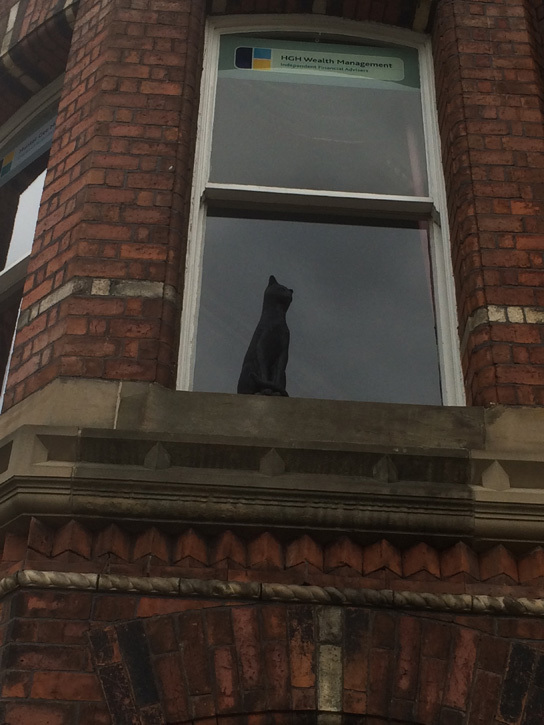 My internet searching led me to a website, Cats in York, devoted to cat statuettes and other decorative cats dotted around the city. The site lists over 20 cat statuettes and provides information on their location, installation date and how visible they are from ground level. Some were installed in the 19th and early 20th century, but many were put in place by local architect Tom Adams as a signature to show which buildings he had worked on. I followed the website's Cat Hunt to five of these statuettes. 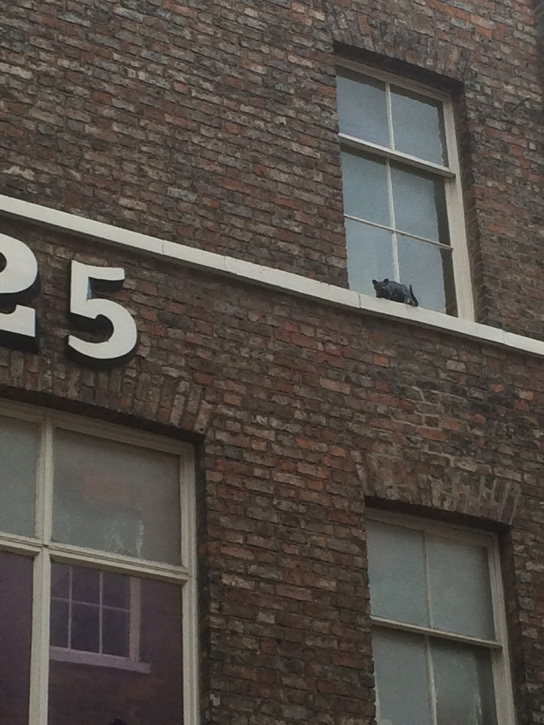 The first one I found is a black cat sitting on a high window ledge in Coney Street. 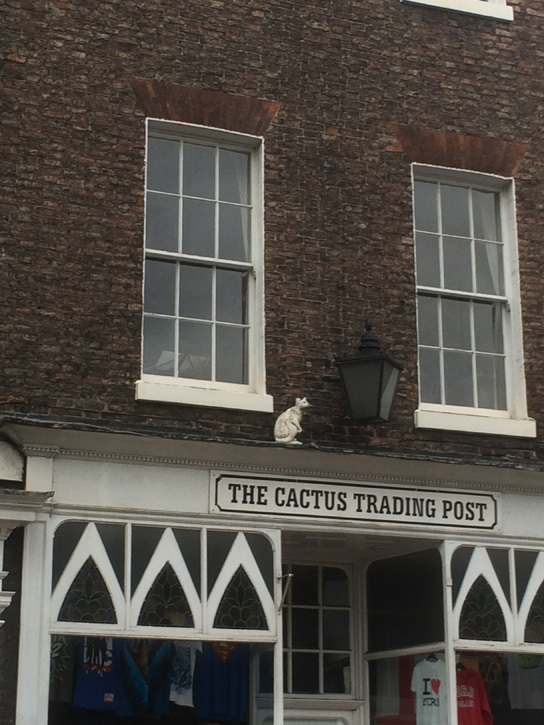 The second cat I spotted is also sitting on a window ledge, looking out across the road towards the entrance to Museum Gardens. 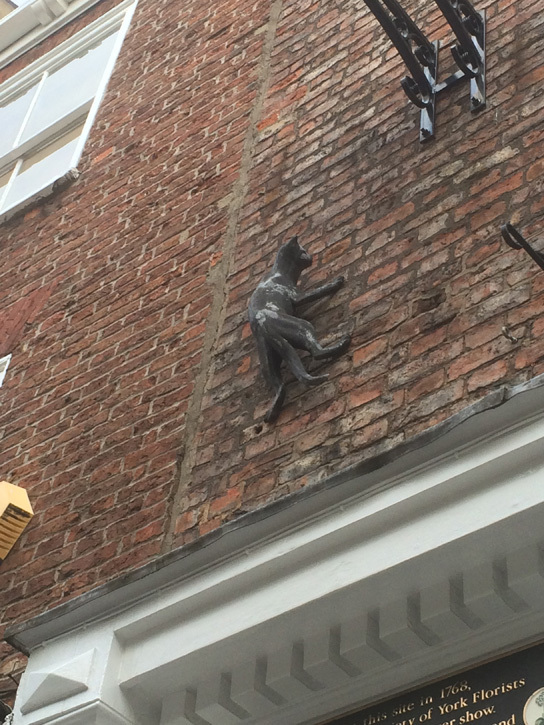 Two cats can be seen on one building in Colliergate. One is climbing up the wall and the other is in relief next to a shop sign. I just had time to find one more before it got too dark, so headed to Gillygate to find a white cat perched above the entrance to a shop. 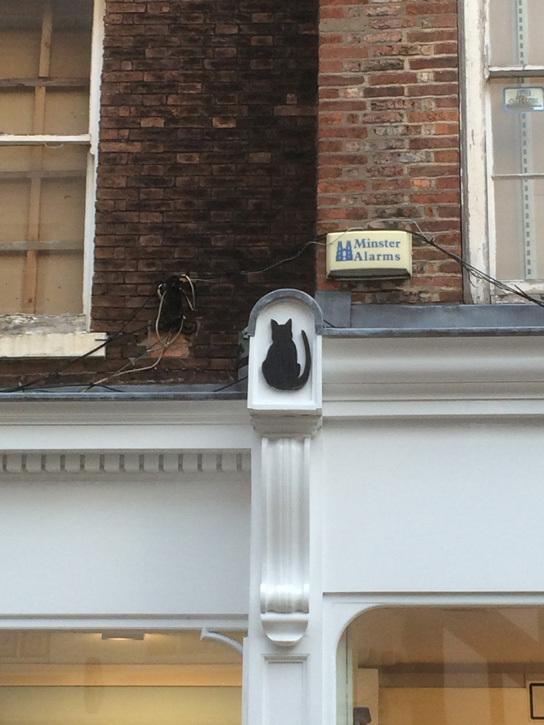 I asked a couple of people who know York well if they were aware of the cat statuettes and neither had heard of them or ever spotted one. 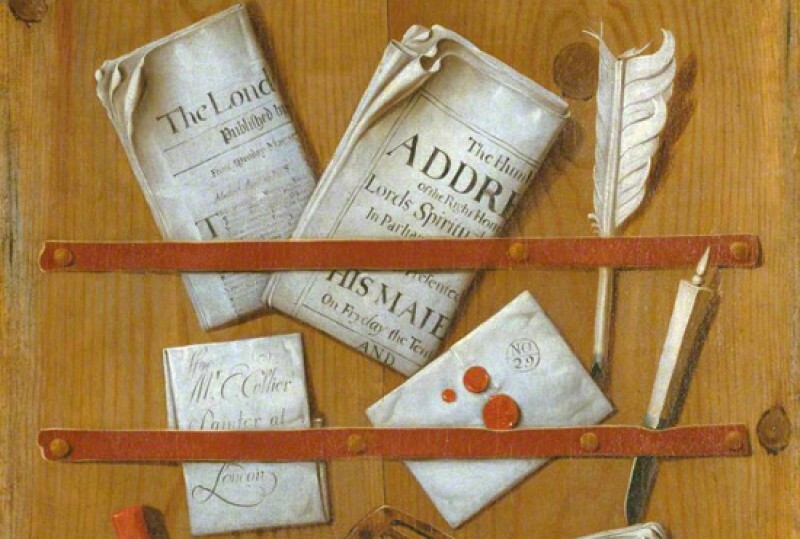 It shows that we need to look more closely at the places we live and visit, as we might find something surprising.